Ann (up front, in pink) singing The Colbert Show off the air in a star-studded ensemble that included Cookie Monster, Michael Stipe, and James Franco, of course. I’m a resolution person. I love the routine and order that comes from making promises to myself. In January, I live my life exactly as I’m meant to, and then over the course of the year I slip farther and farther away from my best self. By December I’m a complete wreck. 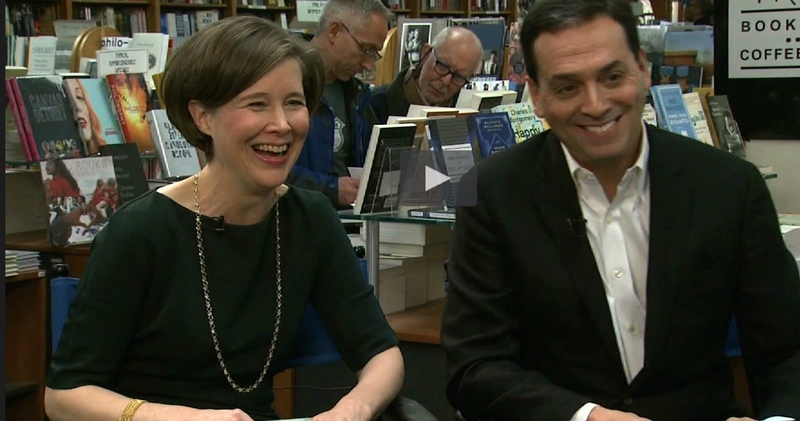 This December I was on the last episode of The Colbert Report (crazy fun) and the next day I went to DC to recommend books on NewsHour. I attended three black-tie fundraisers on three consecutive nights in three states wearing the same dress. I racked up a lot of frequent flier miles and did a lot of reading in airports. I spent too much time thinking about my hair and didn’t write a single word. But now January has come back to return me to my best self. I have turned down all speaking engagements, all lunch dates, all opportunities to do good deeds. I’m happy again. What all of that mostly means is that I’m back to writing my novel. It’s progressing at a glacial pace and I’m glad about that. I like this novel. I’d like to hang onto it for awhile. The more time I spend being a writer, the fiercer I am as a reader. Books that I might have liked last summer now get tossed aside. (Add this to the list of reasons I don’t write book reviews: my kindness is seasonal.) But when I’m writing and I find a book I love, I love it with my whole heart. One of my favorites, and the book that everyone got from me for Christmas, was Jacqueline Woodson’s Brown Girl Dreaming. I do a bad job reading young adult and middle school titles at the store, but so many people had told me this one was brilliant that I finally agreed to read it. Sometimes this is the role of the bookseller: to wear a person down and force her to read a book she’ll love even when she swears she’ll hate it. I bought Brown Girl Dreaming for people on my list ranging in age from 10 to 92, and every single one of them loved it. I gave it to a woman in her early 60s who struggles to read. She told me it was the first complete book she had read in her life, and she asked me if she could have another one just like it. There is nothing like it. It’s Jackie’s own story about growing up in South Carolina and Brooklyn. The genius is that she leaves so much room for the reader to enter the story it’s hard not to feel you’re right there with her. I don’t know how she did it exactly, but it’s an amazing effect. As usual, a lot of my reading time has been devoted to looking for selections for the First Editions Club. We’ve got some extraordinarily good books lined up for 2015 so far, but the one I love the most is our April pick, Abigail Thomas’ What Comes Next and How to Like It. April is a long way away so just forget I mentioned it. I wished I had a copy for my sister, but of course it hasn’t been published yet, so I asked my sister if she’d ever read Abigail Thomas’ A Three Dog Life. She had not. I bought her a copy and as I was about to send it to her, I opened it up. Then I sat down on the couch and read the first chapter, then I stretched out and reread the entire book. This is the best kind of recommendation — when you say, listen, this amazing book is coming so get ready for it by reading an equally amazing book by the same person. No one writes like Abigail Thomas. I have no idea why people aren’t shouting her name in the streets. A Three Dog Life is her memoir about her husband who gets hit by a car while walking their dog one night in New York City, about how he lives and how they continue in their vastly altered existence. Except it’s funnier than that, and sadder, and very tender. If you haven’t already read this book you’ll wonder how you’ve come so far without it. Also: Don’t miss Steve Almond’s profile on Edith Pearlman — including Ann’s comments — in the New York Times. 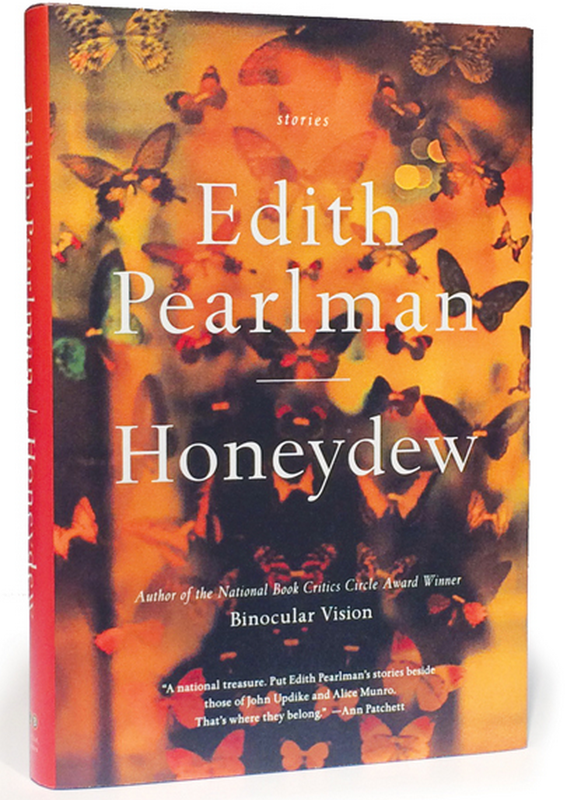 Honeydew is a collection of work so vivid, so true, and so vital that the reader herself comes away all the more real. How can a story do what Pearlman’s stories do? She is an incomparable master. That sums the situation up perfectly. And speaking of the Story Prize, I talked to my pal Elizabeth McCracken just before she left for a Christmas holiday with her family. Her wonderful book Thunderstruck & Other Stories is now a finalist for the Story Prize, having already been on the long list for the National Book Award. Elizabeth told me that her Christmas gift to herself was that she was only going to read books by dead people while on vacation. Elizabeth teaches, and she reads admissions for an MFA program, and she has a lot of friends who are writers, and those things combined mean she always has an enormous amount of reading to do by people who are alive. Dead people! I thought, knowing she was exactly right. I want to read books by dead people too! What could be a better gift than temporarily suspending my search for the next great thing and reading something I already knew was great? I decided that not only would I read books by dead people, I reread books by dead people. In the last post, I was thinking about how much I had loved Updike’s Rabbit Angstrom novels, and how maybe, if I remembered them correctly, they would be my candidates for the Great American Novel. And so I decided to start in the middle of the series (I didn’t much like the first two books) and read Rabbit Is Rich again. That book won the Pulitzer Prize, the National Book Award, and the National Book Critics Circle Award. Reading it for the second time 16 years later, I still thought it was pretty much the best book I’d ever read. And yet recommending Rabbit isn’t simple. To say it’s incorrect is an understatement, not just politically incorrect but incorrect in just about every way imaginable. It’s a giant, offensive, brilliant novel that will make everything else you’ve read lately feel like slices of wet toast stacked together. I was talking this over with Kevin Wilson recently and he agreed that most other books had come up short since reading Rabbit when he was in his early 20s. One of the things that made the book even better for me this time around was the fact that I had finally read Sinclair Lewis’ Babbit last year. Rabbit owes a lot to Babbit. After I finished, I read half a dozen new books that didn’t wind up being any good at all. Now I’ve just started Rabbit at Rest. It won the Pulitzer Prize, the Howells Medal, and the National Book Critics Circle Award. I remember liking it even better than Rabbit Is Rich. I kissed John Updike once. He was giving me an award at the American Academy of Arts and Letters in 2006. While we waited together on the crowded stage for our names to be called, he asked if he could kiss me when he presented the award. I said if he would kiss me he could keep the check. It was a big check. He kissed me and he gave me the check, proving what a gentleman he was. I can never remember the name of that award but the kiss stayed with me. Like the books. Maybe even more.